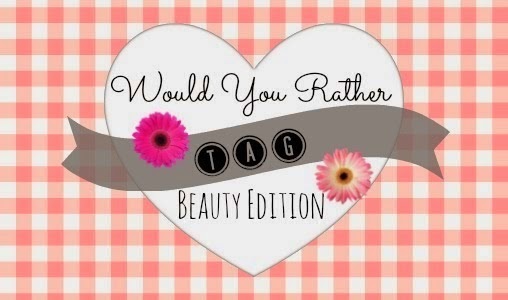 I know that this is straying slightly from what I would normally post, but I was recently tagged by the lovely Dagmara from Mummy's Beauty Corner to fill out the "Would You Rather..." Beauty Edition tag and I thought that it would be fun to fill out! This is my first 'tag' so I hope that you enjoy reading it! Would you rather lose all of your mascaras, eyeliners, lipsticks, and lip glosses or lose all of your palettes and eye shadows? All of my palettes and eye shadows. I hardly have any time to apply eyeshadow nowadays even though I would rarely be seen without it once upon a time! I am more likely to be spotted wearing lipstick and mascara casually every day so I don't think that I could be without those! Would you rather chop all of your hair off or never be able to cut it again? Would you rather have coral cheek or pink cheek? Ah! It depends on my mood! However, coral does suit me a little better, so if I have to choose then I will go with coral. If you had $1000 to spend, would you rather buy clothes or make up? I would want both! Haha! I would imagine that the bulk of that money would go on clothes though as the total would come up to a higher amount. If it were perfume though... now that would be awesome. Definitely lipstick as eyeliner. I'd most likely look like a clown, but I'd totally try to pull it off as an eyeshadow. Well, that would depend on the colour... I don't tend to wear reds around my eyes, for example! I live in the UK, so we don't have a Sephora. With that said, if Sephora was in the UK then I would choose there because of the wider range. One eye shadow colour. Like I said before, I rarely wear eye shadow but I do rather like my lipsticks! I prefer my summer wardrobe over my winter one, so I would probably say I'd rather wear my summer clothes in winter. However, the UK is cold. Therefore, if I were to look at it from a practical point of view it would definitely be winter clothes in summer (which happens anyway)! Bright nails. Don't get me wrong, I love my dark shades. I really, really do. Something about bright nails always manages to perk me up though, so I would have to say bright. Would you rather give up your favourite lip colour or favourite eye product? Are we talking eye products as just eye shadow, mascara etc? Or any type of eye makeup? My favourite eye makeup product is currently Benefit's Lemon Aid and I really don't think that I would be able to give that up now! I do also rather love my mascara. This is a tough question. I'm going to have to say give up my favourite lip colour, as sad as that makes me! I can't wear my hair in either! However, I would choose a messy bun. Would you rather never be able to paint your nails again or never use lip gloss? Never use lip gloss. I prefer lipstick over lip gloss anyway, but nails win hands down. I love nail polish! I hope that you enjoyed this post! My regular type of posts will continue soon!